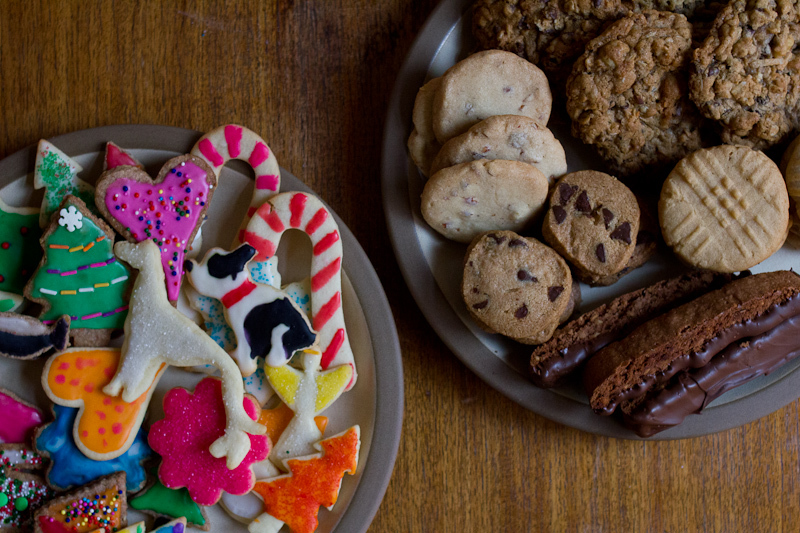 Every year, I host a Christmas cookie party. 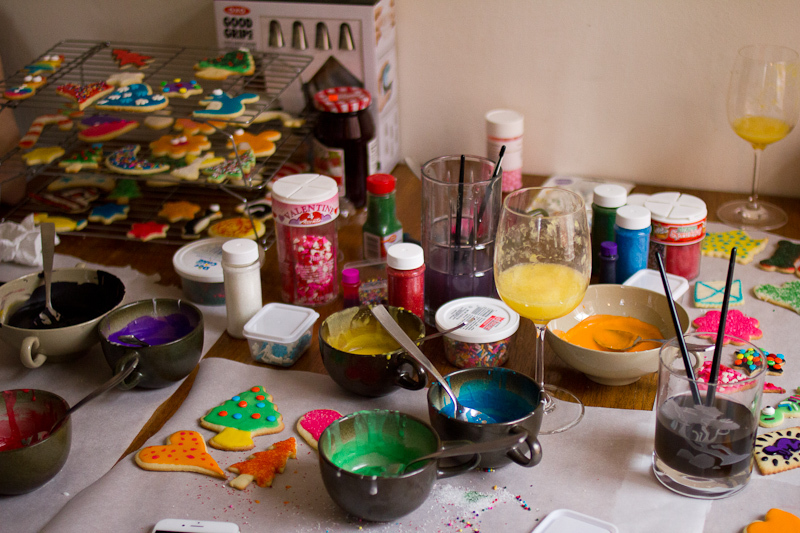 We bake and decorate, drink mimosas, eat take out tacos from spot next door. The tradition actually goes back further to when I was living in D.C. during college. My Maryland family, the Adinehs, would host a Christmas cookie party of impressive proportions. If there were not at least 12 types of cookies baked and two card tables piled high with delicious treats by the end of it, we had not done our job. 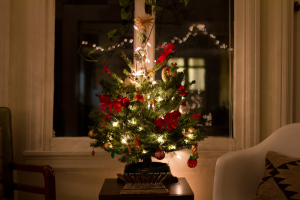 I learned from the best, and try to recreate it every year in considerably less kitchen real estate. This year, our friend Kelly brought a new technique to the table. She made her own cookie cutters! 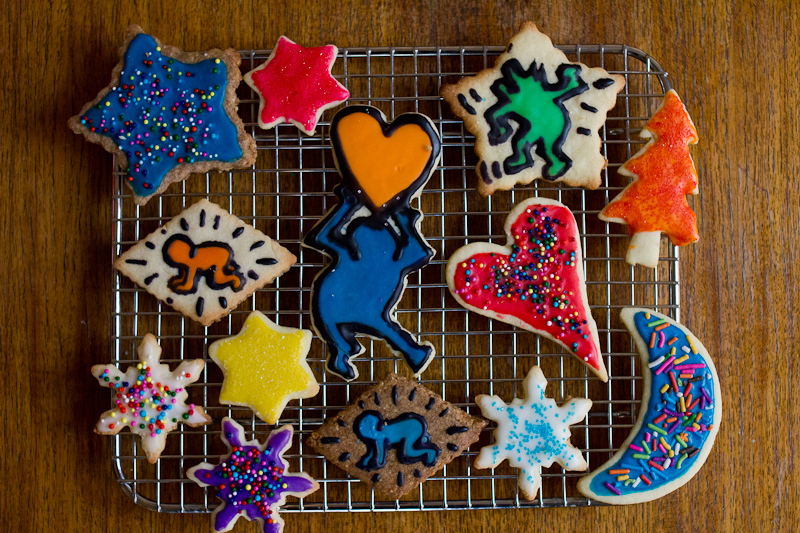 Using this tutorial, she made a cookie cutter based on her Boston terrier puppy Nibbler and another based on the artist Keith Haring’s work. Serious cookie dedication. We were all impressed. Go Kelly! 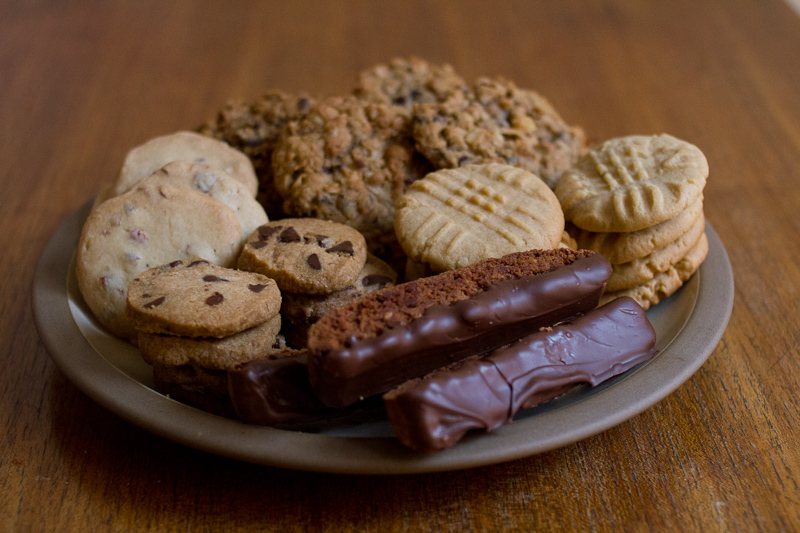 There were also Laura Bush’s famous cowboy cookies, whole wheat chocolate chip sablés, peanut butter and jelly sandwich cookies, pecan sandies, and double chocolate biscotti for my Food Blogger Cookie Swap friends. 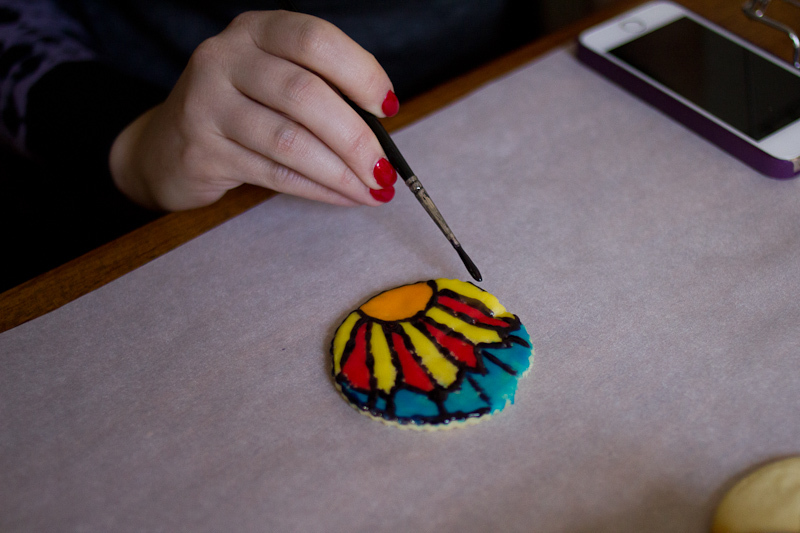 We baked from 11 am to 8 pm, which is precisely why Cookie Day is one of my favorite holiday traditions—pure dedication to the art of cookie making combined with very little restraint. I cannot wait for next year. Beat the butter until it is light and fluffy. Add the vanilla and sugar and cream together for a few more minutes. Add the egg. In another bowl, sift together the salt, baking powder and flour. Add flour mixture into the butter mixture and stir until combined. Divide into two balls, flatten into discs and refrigerate for 4 hours or overnight. 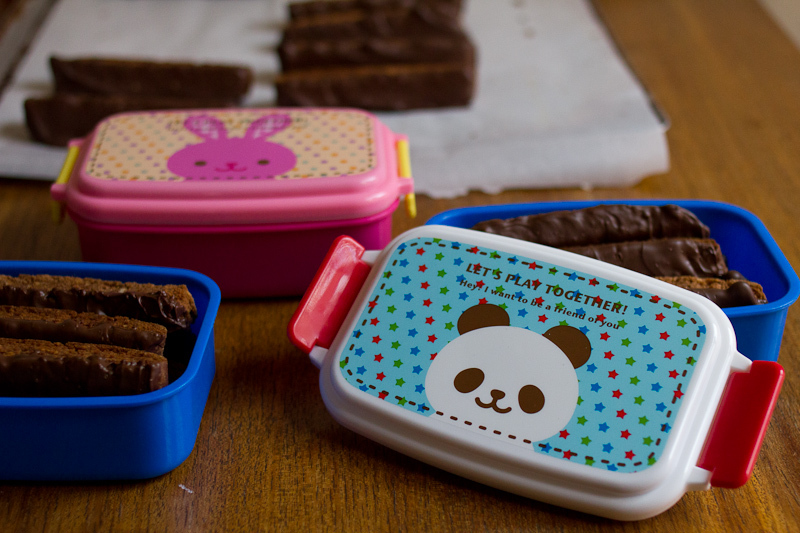 Roll out into 1/4″ thickness and cut with cookie cutters. Bake at 400° for 6 – 8 minutes. These babies cook fast so set a timer! Sift the powdered sugar into a large bowl. Start with 3 tablespoons of milk and whisk together. It will be a big sugary clump. Add a tablespoon of milk at a time, until you get a smooth icing. Careful though, you don’t want it to be so runny it runs of the cookie. Divide into as many small bowls or cups as colors you’d like to make and add the food coloring. I’d recommend getting a pack of cheap paint brushes so you can get real precise with your icing. In the bowl of a stand mixer, beat together the eggs, egg whites and oil. Add in the sugar, vanilla, salt, and flaked coconut, and mix to combine. In a medium bowl, mix together the flour and baking power. In a sauté pan, brown the nuts over medium heat. Pour the nuts into a food processor and pulse a few times, add the chocolate chips and pulse a few more times. This will chop both up a bit, and also start to melt the chocolate. Add the nut and chocolate mixture to the stand mixer, and mix to combine. Slowly add the flour mixture on low speed, and mix until all of the flour is incorporated. Divide the dough into four parts. Scoop the dough onto four pieces of plastic wrap. Wrap in plastic and shape into a flat log shape. This takes a little maneuvering, but you can make it happen. Let the dough chill overnight. 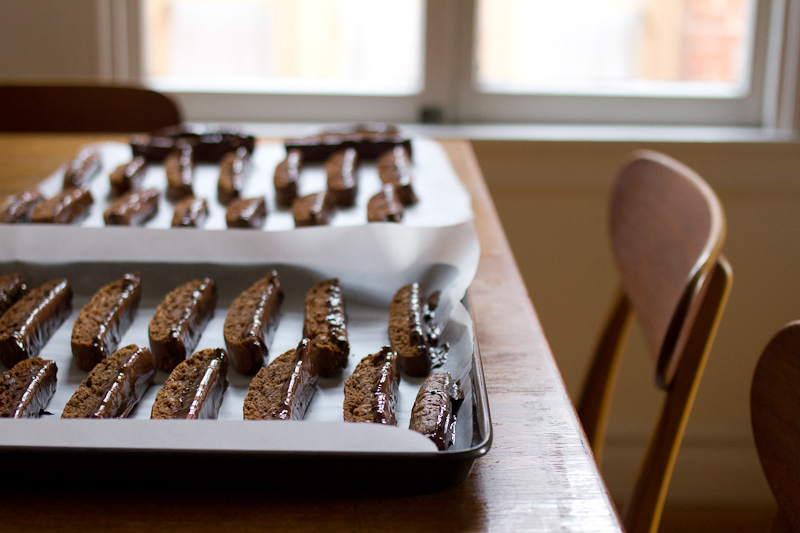 Preheat your oven to 325° F. Line two baking sheets with parchment paper and place two biscotti logs on each baking sheet whole. Bake for 40 minutes. Remove from the oven and using a sharp knife, cut the logs into strips. Spread the strips apart and turn them onto their sides. Return to the oven and cook for about 20 more minutes. You want the cookies to be dry and crunchy. Remove from the oven and let cool completely. Once cooled, melt about 12 oz of chocolate in a double boiler. 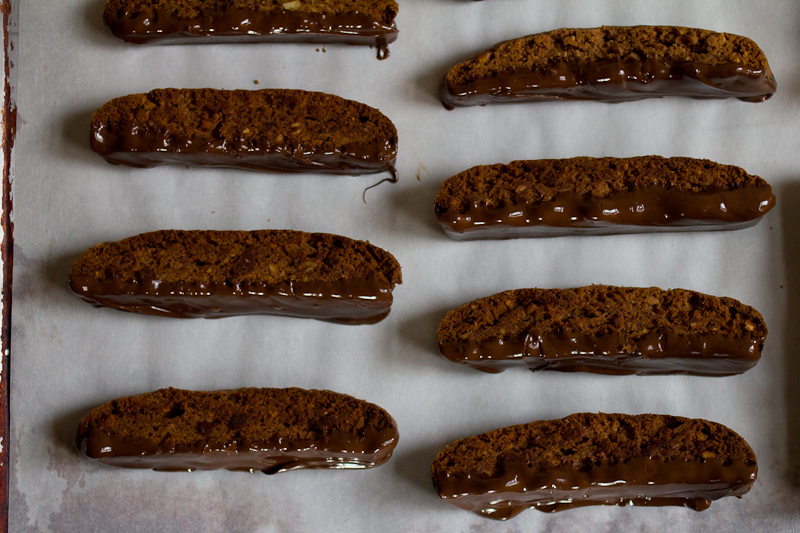 Dip the bottom of each biscotti into the chocolate and then let them rest on their sides for the chocolate to harden, depending on the temperature and humidity, this can take an hour or so. You can also put them in the fridge to quicken the hardening process. Store in an airtight container. These are Hilary’s go to cookie. They are huge, chewy and delicious. She says she likes to keep a roll of dough in her freezer and slice of a cookie or two when she needs a pick me up. I’m digging that idea. Like all things Thomas Keller, these are lovely and refined. Kelly says that the batch is on the small side, and you should double it if you’re not making other types of cookies. I follow this recipe, but swapped 2/3 cup of semi-sweet chocolate chips for the cocoa nibs. I’d love to try them with nibs, I’m sure they’d be lovely. I also may have let mine cook a few minutes long, but that added a pleasant browned butter flavor, so no harm done. Robin made a double batch and then sandwiched some jelly between two cookies. I’m working with a creative bunch here. These were a bit of a challenge. We used them as roll out cookies for decorating, but they required quite of bit of persistence and wrangling on the behalf of Kelly to be shaped into submission. They’re tasty, but I think we’ll try something else next year. double chocolate biscotti – my absolute favorite!!!! 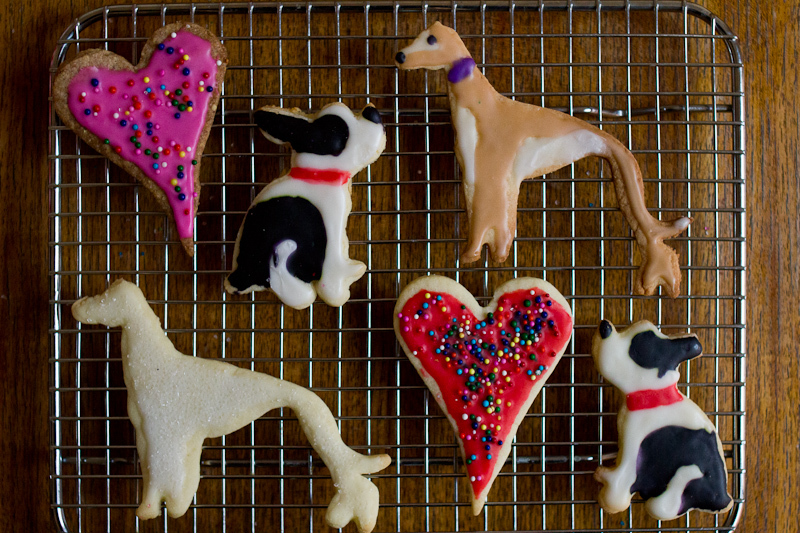 also, i spy a greyhound cookie. swoon! It’s hard to go wrong putting chocolate on chocolate! 🙂 Greyhound cookie cutter can be found on Amazon, if you feel so inclined. Xo!